On a global level, the EU emerges as the most important foreign direct investor, also if considering extra-EU investments only. This reflects the capability and propensity of EU firms to internationalize their business activities. A joint analysis of two methodologically very distinct databases - Eurostat FDI data for FDI flows and stocks, and the FDI Intelligence from Financial Times Ltd. for the number of investment projects - made it possible, for the period 2001-2007 and 2003-2008 respectively, to reveal several facts and trends concerning the competitive position of EU firms in the BRICs and vice versa. The EU is among the main investors in each of the BRICs and the dominant investor in Brazil and Russia. In China and India, the EU has less weight. But after correcting for particularities in FDI data, such as the prominent role of Hong Kong and off-shore centres in Chinese FDI and of Mauritius in Indian FDI, the EU ranks higher also in these countries. In a direct comparison with the US and Japan, the EU emerges as the leading investor among the Triad countries in each of the BRICs. This suggests that EU firms are well positioned to compete with other multinational corporations in the BRICs. The analysis of the number of projects confirms this finding, the role of the EU in China is much greater than suggested by FDI data. China emerges as the main BRICs target for EU projects, but in terms of FDI inflows China occupies rank three after Russia and Brazil. The divergent results can be explained by the small number of very large projects in the natural resource sector of Russia and the great number of finance- and trade-related small investments in China. 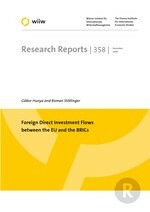 In some cases, FDI has become the major entry strategy of EU firms into the BRICs markets. Global and EU-15 investments in the BRICs, as measured by the number of investment projects, were resilient to the global crisis until 2008. With regards to the current economic downturn and the expected drop in global FDI, the BRICs may find themselves in a privileged position in several respects. First of all they are large economies where FDI is mainly attracted by the local markets with growth expectations above world average, although not in Russia. Local economic growth especially in China and India will allow for FDI to grow if companies from crisis-hit countries are in the position to invest. Larger multinationals may increasingly concentrate on the very few countries in the world where they can expand sales, such as China, India and Brazil, and shift investments there. Also for European companies the expansion to the BRICs remains a major attraction. Due to the size of the BRICs and their distance to Europe, only larger or more specialized investors may benefit from this opportunity. The main conclusion based on the statistical analysis is that the EU is well positioned as a direct investor both on the global level and in the BRICs. In the fast growing markets of China and India, however, the share of EU firms in total FDI is rather low and not particularly dynamic. As investments in such geographically more distant places are mainly realized by large corporations while SMEs typically limit their foreign operations to nearby countries, policy levers may be necessary to expand EU presence there. This is all the more desirable as China and India have a high market potential and EU firms can expect high returns on FDI.